RuUp4It? : Charleston parents R Up 4 It! Charleston parents R Up 4 It! Norman and I had a very busy evening last night at Charleston Academy meeting parents of S5/6 pupils and several members of staff interested in being part of our project to reduce food waste. Hopefully lots of involvement with the school over the coming months. 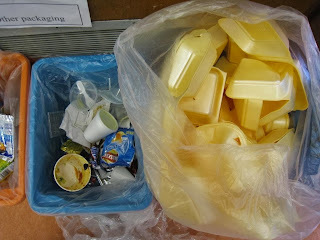 Best thing we learned last night - the school has changed over to china plates in the canteen - doing away with the huge number of polystyrene bun boxes they had when we did a waste audit last year.